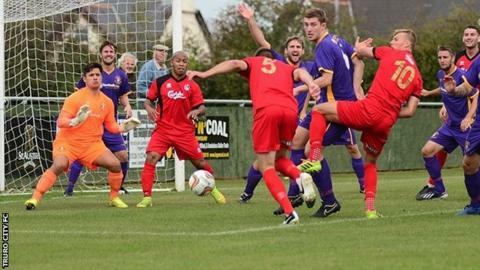 Truro City manager Steve Tully is hoping to sign a new striker after his side's 2-1 home defeat by Slough Town. Craig Duff gave City the lead with his sixth of the season after they missed a host of chances, but Slough hit back with two second-half goals. Truro were without Barry Hayles, who needed stitches after cutting his hand with a knife just before kick-off. "We dominated, but I need someone who's going to put the ball in the net on a regular basis," Tully said. "You look at the players we've brought in, they haven't scored the goals that we want, so we need someone who's going to score goals. "Myself and Wayne (Carlisle, assistant manager) will be out looking for a centre forward that's going to score us goals," he told BBC Radio Cornwall. Former Fulham and Leicester striker Hayles, 42, was trying to cut an apple when he slashed his hand, forcing him to miss the Southern Premier League match. "These things happen and his experience would have helped in the last 20 or 30 minutes of the game. "But for how good we were for the first 60 minutes, we were as bad for the last 30 minutes," said Tully. "They scored their first goal through a wall, which was sloppy and the second goal was a lack of marking, and a lack of leadership on the pitch. "It's disappointing because that was three points on the board for us, they were a poor team, and we've come unstuck against a poor team."